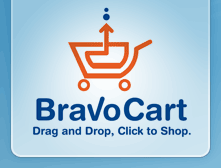 BravoCart is the easiest to use shopping cart software that you will find. Other solutions add unneeeded complexity and require technical knowledge that most small business owners do not have. Our simple yet scalable solution can get your store up and running in no time at all. Also be sure to check out our revolutionary Flash shopping cart solution. The following are some resources. For a limited time we are offering a free month of any BravoCart version. Simply cancel within the first 30 days and you won't pay a dime. It's a completely risk free way to start selling your products online today. Sign up today and find out what makes our solution the perfect fit for your e-commerce needs.